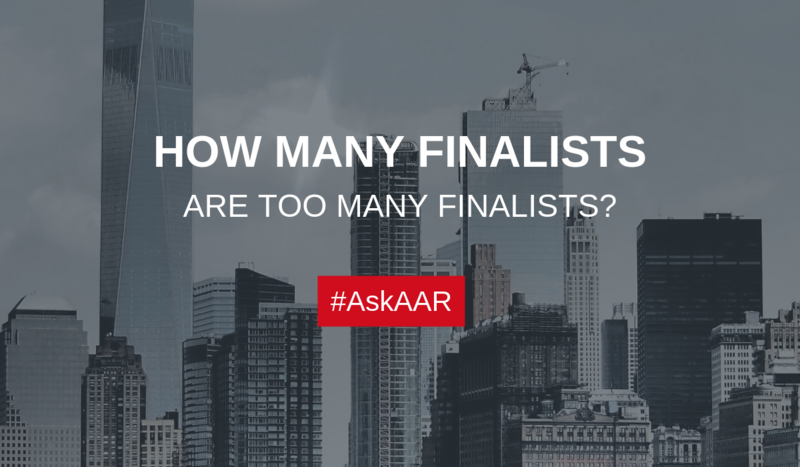 How Many Finalists Are Too Many Finalists? How Many Finalists Are Too Many Finalists? from AAR Partners on Vimeo. I often chuckle at this since it somehow reminds me of how many clowns can fit into a clown car? The fact is, eventually you need to get to one agency that you will select to be your agency partner (and hopefully, for years to come). Yes, there are many fish in the sea and it’s easy to start questioning if you should add more agencies to the consideration set to increase your chances of finding the right agency. Here’s the key insight, if you’ve done a comprehensive upfront search process and you’re now down to the final handful of agencies, any of them can have a solid partnership with you. And let’s be clear: there’s no magic pill for a perfect partnership. It takes commitment, dedication, constant effective and honest communication and yes, some sacrifice too. The other finalists will find out and will question the validity of the process. The other finalists will find out and feel that they don’t have a fair chance at winning the account. And both basically boil down to the perception that you have a predetermined outcome of the review. So how many finalists should you have in the mix? Three to five tops! More than five and you’re pretty much dealing with a group of semi-finalists and not finalists. Keep in mind that they need to place their efforts and overhead on an opportunity with the highest win rate and a one in three chance at winning versus a 20% chance at winning is a big difference. So if you’re adding more and reducing that probability by less than 20% then the probability is you will lose out on some great agency options since they will likely drop or pass on the process. Good luck with your agency search and if you need any guidance, think of AAR Partners!